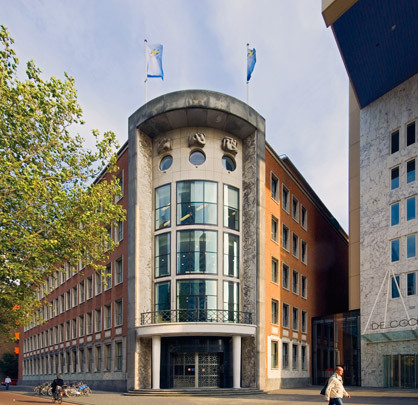 Although the post-war rebuilding of Rotterdam was dominated by the 'objective' architecture of the Groothandelsgebouw (Wholesale Building) and the Lijnbaan shopping precinct, the first new buildings to emerge after the war were these traditional bank premises: the Twentsche Bank by A. van der Steur, B. Hooijkaas Bzn. and B. van Veen, the building for the Nederlandsche Handel-maatschappij (Netherlands Trading Society) by C. Elffers and A.A. van Nieuwenhuyzen and this Amsterdamsche Bank/Incassobank by the Kraaijvanger brothers. Almost identical in volume, they share the same building line so as to present a monumental urban elevation along Blaak. The building for the Incassobank, which merged with the Amsterdamsche Bank during its construction, has a cylindrical mass at the corner containing the main entrance and the stair. A circular structure on the roof used to house the canteen. Originally, a new building for the US Consulate was planned at the western facade, which explains the largely mute character of this wall. The ground floor houses the cash hall and the public zone and is otherwise almost entirely taken up with a large double-height staffroom. A gallery on the first floor gives a view into the staffroom's central well. Mergers in the banking world deprived these buildings of their duty as head office. At the end of the 1980s, there were plans to demolish them and replace them with new-build. Comité Wederopbouw, an initiative concerned with preserving reconstruction-era architecture, protested against these plans with success. In 1995 the three banks were proclaimed city monuments and at present contain offices and related functions. The Incassobank is in use by the Chamber of Commerce since 2001.